Has the Phillips Curve disappeared or just flattened? In economies as diverse as Japan, the UK, the USA, and Canada, the traditional shape of the Short-Run Phillips Curve (SRPC) has not been observed statistically recently. In the last few years, unemployment has been falling in these economies. This would suggest (if the SRPC is correct in predicting a trade-off) that inflation should be rising. But it has not. Indeed in Japan deflationary pressures continue to be worrying and the Bank of Japan is still striving to attain its target of 2% inflation. What are some possible reasons for this? a lowering of inflation expectations (the SRPC is still there but it has shifted left). changes to the structure of the labor market have caused a fall in the natural rate of unemployment (the Long Run Phillips Curve has also shifted left). Frictional unemployment is lower because the labor market (with the help of the internet) has become more efficient at matching the unemployed workers to unfilled vacancies. Structural unemployment is lower because there have been educational reforms and more training provided. unemployment is not actually as low as it appears, because there is a lot of underemployment (particularly in Japan,where many people who have a part-time or temporary or non-regular job would prefer to have full-time employment). labor has less power or willingness nowadays to push up wages even when the labor market is tight. In Japan, at least, job security is looked on as more important than rising wages. Labor Unions appear to be less forceful and less willing to strike. this could be due to globalisation. Firms now have the power to move their factories overseas, if domestic wage costs are seen as too high. Policy makers have relied on models like the Phillips curve to predict inflation and decide whether to have contractionary or expansionary policies. It is going to be much harder to know where inflation and inflationary expectations are heading. However, the good news is that possibly economies can now achieve high growth and low unemployment without needing to worry about inflation surging. Both the Keynesian and the New Classical Models may need re-designing. Is the concept of the “inflationary gap” no longer valid? The economy is experiencing more sustained growth than at any time in the last 25 years. Real GDP has risen for six quarters, based partly on higher investment and partly on government expenditures. Thus the “output gap” is now judged to be an inflationary gap (actual GDP>potential GDP). In a recent survey of Japanese companies, 70% said they were planning price increases over the next year and the lowest wages are improving (partly aided by a rise in the legislated minimum wages). Consequently it is possible that Japan will soon escape from the deflationary spiral due to the increasingly tight labor market. This would imply that the Phillips Curve does still exist in that lower unemployment will be associated with positive inflation. For the situation in Japan; https://www.leggmason.com/en-us/insights/investment-insights/has-the-phillips-curve-flattened. For almost ten years, interest rates have been remarkably low and even on occasion negative (in Japan). Central banks have deliberately kept them low, while expanding the supply of money (quantitative easing), as a means of allowing the global economy to recover from the 2008 financial shock. But the era of “cheap money” (remember to consider interest rates as being both the cost of borrowing and the price of money) will probably end this year. The US economy, in particular, seems to be in an inflationary gap with an unemployment rate of only 4.1%, which could be below its natural rate of unemployment. And, in countries such as Britain, inflation is already above the Bank of England’s target of 2%. Consequently, the Federal Reserve (the US central bank) and some other central banks (but not the European Central Bank nor the Bank of Japan), will want to raise interest rates soon and significantly in order to deter borrowing for investment and consumer expenditure for large-ticket items (such as cars) which are bought on credit. This would shift aggregate demand to the left. Without low interest rates, speculators and dealers in shares and property cannot borrow cheaply to continue purchasing these assets whose prices have risen faster than wages in recent years. More seriously, for the real economy, some firms which have relied on low borrowing costs to keep going may go bust should their bank raise loan rates. These forebodings are the main reason for the volatility of share prices in the last week. The large drops are also partly due to the inevitable and necessary correction to a speculative bubble, which has also been observed in bitcoin dealings. It is however unfortunate that the side-effects of such gambling in assets impact the real economy, in terms of investment in capital and employment rates. JM Keynes observed that stock markets are just casinos but “When the capital development of a country becomes a by-product of the activities of a casino, the job is likely to be ill-done”. The Fair Trades Commission (FTC) is investigating several construction firms on suspicion that they have been colluding (by sharing information and dividing up projects) in tendering for construction work on the Tokyo-Osaka maglev train line project. If the firms have formed a cartel (even a tacit or informal one) to engage in bid-rigging (price-fixing), they are violating anti-monopoly laws and could face very large fines. But following the initial raids, one of the companies, Obayashi, reported to the FTC that it had conspired with three companies for maglev construction tenders. Under the FTC’s leniency rules, companies voluntarily reporting antitrust violations escape a fine. The company that does so first will also avoid criminal charges. Possibly, therefore, game theory analysis could be used to analyze what is likely to happen. Is there a dominant strategy to confess? And a few days later, another company, Shimizu, after initially denying wrongdoing, confessed to fixing bids for construction projects. But two other firms are still maintaining their innocence. They apparently admit that officials met and exchanged information about the projects, but deny that they actually fixed bids or split the projects among them. Nonetheless, you could still try setting up a pay-off matrix for Obayashi and Shimizu to show why they both confessed, hoping for lighter fines. In the US corporate taxes are being reduced. The intention is to stimulate investment and to persuade US companies not to relocate overseas. But suppose the reductions are just used to increase profits for owners and shareholder or to increase management wages? There needs to be a way to make the incentives work as intended. In Japan, the government has decided (probably from April 2018) to stop corporate tax incentives (“tax breaks”) by which large companies can pay less tax under certain conditions (such as for R&D), if those companies do not increase wages and investments (spending on capital). The need to increase wages in Japan is aimed at increasing consumption. If consumption and investment can increase significantly, there will he less need for aggregate demand to be stimulated by fiscal policy or net exports, on which Japan has been relying to promote growth. 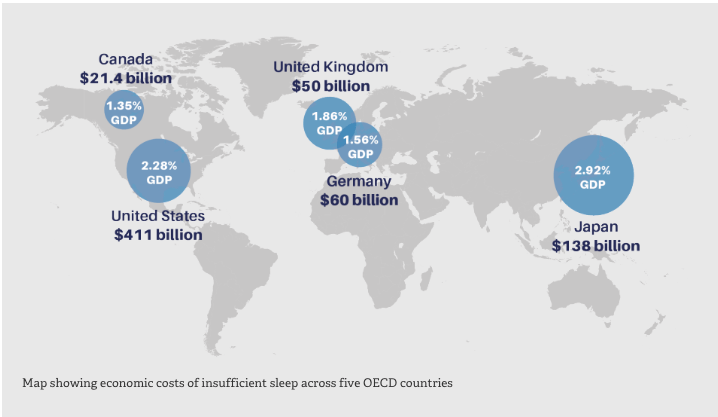 Economists and others have started to calculate the economic costs of a lack of sleep. 56% of the Japanese sleep only seven hours or less which is the highest percentage with sleep deprivation among these five nations. It is argued that a nation’s productivity and health would improve if we all slept for seven to nine hours per night……and that includes your productivity as school students.